This unusual and seasonally right holiday salad recipe features a dressing made with fig balsamic vinegar. Flavored vinegar is enjoying a moment -- balsamic being the most popular -- and makes simple salads unique and interesting. This recipe comes courtesy of the website JD Gourmet. Flavored vinegar is plain vinegar infused with herbs, fruits or spices to give it a characteristic and offbeat flavor that changes the entire vibe of the salad you dress with it. Dressings made with flavored vinegar come with health benefits as a bonus -- they are low in calories and sodium- and preservative-free. Balsamic is dark brown in color, and the genuine article is made in Italy from the unfermented grape juice. Because it comes from grapes, it is pressed and then aged like wine. Its price varies depending on age -- the older it is the more expensive it is. Red wine and white wine vinegar, the red being sharper and the white having a milder taste, are essential in vinaigrette dressings. Tarragon vinegar is made of malt and distilled white vinegar and infused with tarragon, which imparts a bittersweet flavor. Apple cider vinegar has long been a kitchen staple and is made of fermented apples. If desired, substitute dried figs for the cranberries to enhance the dressing. Fresh figs from California are seasonal from June through September. Dried figs are available all year-round but are often used during the winter holidays. Dried figs are deliciously sweet, soft and sticky, but all that comes with a price: They contain 317 calories in a cup and 95 grams of carbohydrate. No wonder they are thought of as a holiday treat.) The good news: 15 of those grams count as fiber. They're also chock-full of calcium, magnesium, and potassium. As part of a shrub for a cocktail -- a fruit syrup that is made with fresh fruit, vinegar, and sugar and mixed with your alcoholic beverage of choice. Mix the vinegar, pepper, mustard, salt and olive oil in a small bowl with a whisk. 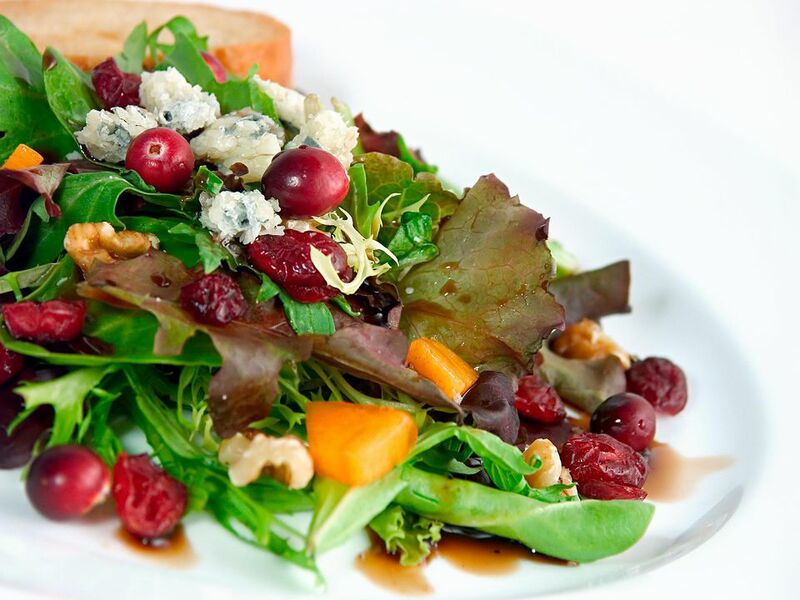 In a large salad bowl, toss the greens, cranberries, feta cheese and walnuts together.